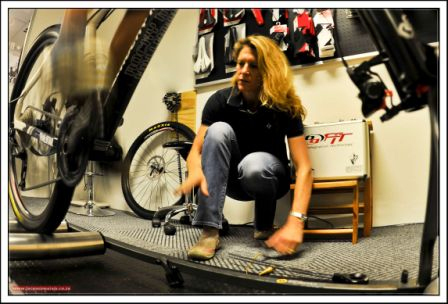 Have you had your bike set up to suit your biomechanical profile? The Dynamic BG Bike FIT Studio is proud to offer BG FIT Bike Fittings. BG FIT from Specialized is the only complete bicycle fit system that will allow anyone to ride faster, longer, in greater comfort and boost power while greatly reducing the chance of injury. This process can be used to set up any brand of bike (Mountain, road or tri-bike). As a BG FIT Technician, we have been trained to analyze the body’s unique attributes, pedal stroke, and body position. Using the data gathered during the advanced physical assessment, we will optimize a cyclists bicycle and equipment to match their biomechanical profile. Thanks to a full selection of ergonomically enhanced equipment and apparel, the BG FIT studio has the only fit system that can truly match bike to body.